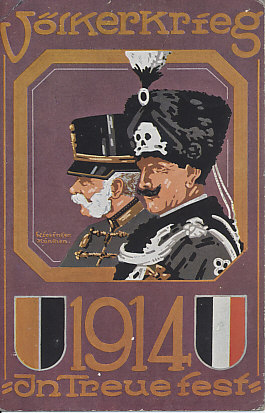 Postcard of Kaiser Wilhelm II and Kaiser Franz Joseph, in the Secessionist style. Kaiser Wilhelm is wearing the uniform and shako of the Death's Head Hussars. Wilhelm Hohenzollern, King of Prussia and Emperor of Germany, also held the title of Supreme War Lord. He had ascended to the throne in 1888. Wilhelm appointed Alfred von Tirpitz head of the Imperial Naval Office in 1897 to spearhead the expansion of the German Imperial Navy. Wilhelm also oversaw widening of the Wilhelm Canal (named for Wilhelm I) which allowed Dreadnought-size ships to pass between the North and Baltic Seas. The widening was completed in June 1914. 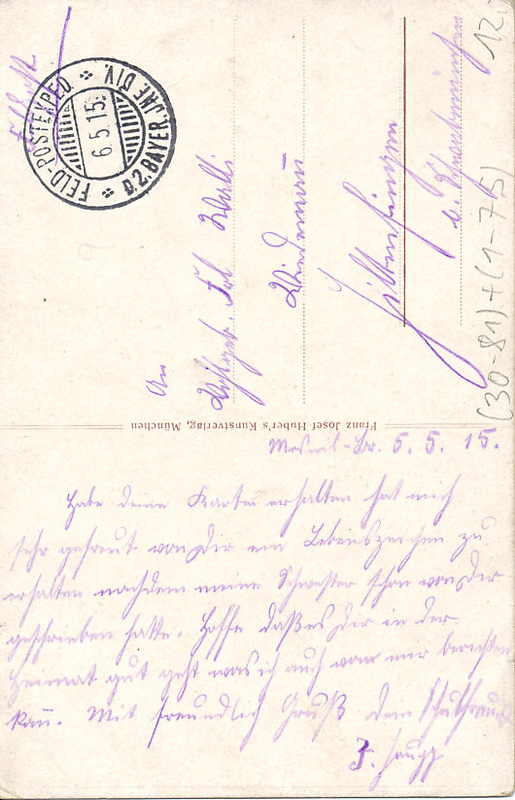 On July 5, 1914 Kaiser Wilhelm promised the Austro-Hungarian Ambassador Germany's support for action against Serbia. The Ambassador reported the Kaiser as saying, "should a war between Austria-Hungary and Russia be unavoidable, we might be convinced that Germany, our old faithful ally, would stand at our side." Wilhelm, bellicose and full of bluster, moderated as days passed, but he was kept in the dark about some of Germany's preparations for war. On September 14, 1914, after the defeat at the Marne, he replaced Helmut von Moltke with Erich von Falkenhayn as Chief of the General Staff. As Supreme War Lord, Wilhelm was called upon to settle disputes between Falkenhayn and Paul von Hindenburg who, with his chief of staff Erich Ludendorff, commanded German forces on the Eastern Front. After Falkenhayn's defeat at siege of Verdun, Wilhelm replaced him with Hindenburg . To the Entente Allies, Wilhelm personified Prussian militarism, and many held him personally responsible for the war. 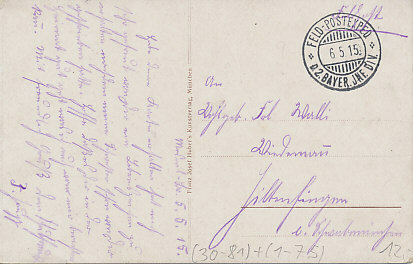 Wilhelm abdicated on November 9, 1918, and fled the next day to the neutral Netherlands where he died in 1941.